Another great concert announcement for the area, as Colin Meloy (lead singer of The Decemberists) will stop by Liberty Hall in Lawrence for a solo show. 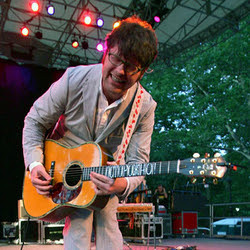 This tour is in support of his solo album, Colin Meloy Sings Live! which is out April 8th on the label Kill Rock Stars. If Colin's solo show is anything like a Decemberists show expect a really good time. I'm sure you'll hear a few Decemberists songs as well.